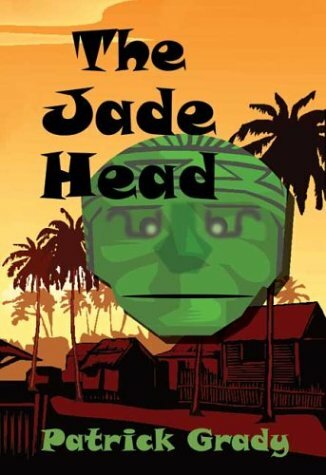 The Jade Head: a novel by Patrick Grady, which takes place in Belize. This is the story of Bob Wayne, a middle-aged accountant, and his girlfriend, Donna Blake. Bob is a “good ol’ boy” who spends his spare time golfing and hanging around with the same group of buddies he went to high school with in Loganville, a small town in downstate Illinois. After getting sacked from his job, Bob gives in to his urge to escape to the tropics for what he hopes will be a Hemingway-esque adventure. Settling on Belize as his destination, he leaves behind two angry ex-wives, four kids, and his disgruntled girlfriend, Donna, who doesn’t buy his story about going to help out with a project for crippled children sponsored by the local Rotary Club. Bob takes up deep-sea fishing and skin-diving after arriving in Belize, and soon becomes involved with a colorful collection of local characters, including an eccentric alcoholic hotel owner, a lion-maned islander, a Canadian archeologist, a British-educated lawyer, a young Mayan teacher, and a Creole beauty with a past. While touring the Mayan ruins, he learns about the famous jade Mayan statute of the Sun God, Kinich Ahau, the largest jade Mayan artifact ever recovered. After meeting a shady American businessman, Nick Devlin, and his beautiful Creole girlfriend, Bob gets caught up in a risky business venture at a jungle plantation that sets his life on a new and unexpected course. In a surprising ending, Bob is forced by circumstances to make some difficult, life-changing decisions that Ernest Hemingway definitely would not have approved of. 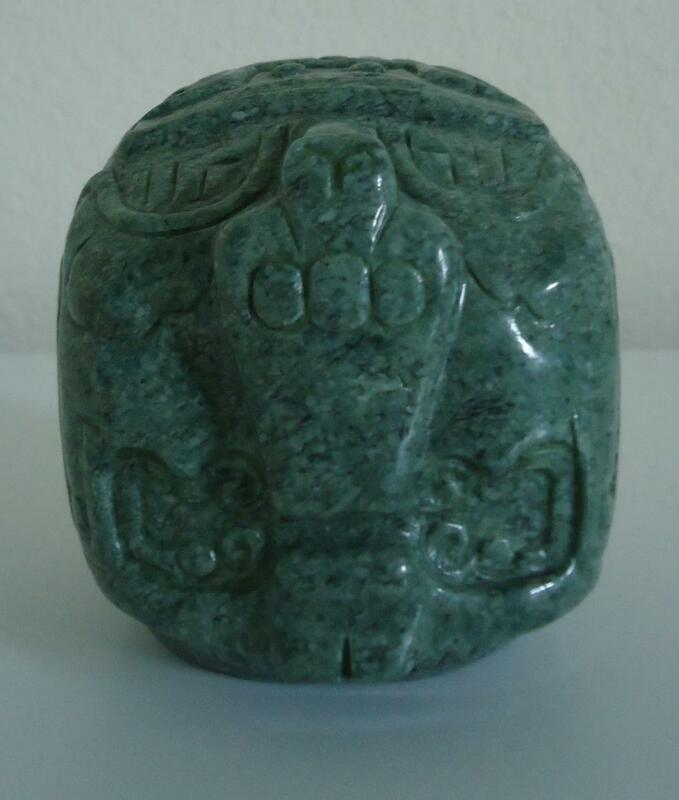 The real Jade Head tells its story. Meanwhile, back in Loganville, Donna struggles to cope with her teenage daughter and Bob’s absence. Experiencing some setbacks of her own, she is forced to come to terms with what she really wants out of life. This humorous and suspenseful story paints a vivid picture of Belize and its diverse and fascinating people, along with a parallel story-line that is a sensitive portrayal of life in small-town Illinois. In addition to being pure entertainment, readers will learn about the diverse cultures of Belize: the Creoles, Mestizos, Garifunas, and, surprisingly, the Mennonites; and travel with the author to Belize City, Ambergris Cay, Cayo, and Orange Walk, and the Mayan sites at Lamanai, Xunantunich, and Altun Ha. Patrick Grady introduces the Jade Head featured in his book. Patrick Grady grew up in Danville, a small town in Illinois, rather like the Loganville in this story. He graduated from the University of Illinois in 1968 and moved to Canada, where he earned a Ph.D. in economics from the University of Toronto. His first novel Through the Picture Tube was published in 2000. The Jade Head was inspired by a series of business trips he made to Belize for the World Bank. Dr. Grady is the President of Global Economics, Ltd., an Ottawa-based economic consulting firm. He has been a senior official of the Canadian Government Department of Finance and the Bank of Canada. He has served as a consultant to the United Nations and the World Bank in Latin America, Africa, Asia, and the Former Soviet Union. Patrick Grady is the author of five books and over 100 journal, magazine, and newspaper articles on economic issues. THE JADE HEAD (ISBN 1-93174144-1; size: 6 x 9; soft cover) is available from at Amazon.com and Amazon.ca. and for Kindle on Amazon.com.